Usually returning to a quiet, peaceful home is welcoming and rewarding. Last Friday evening was different. 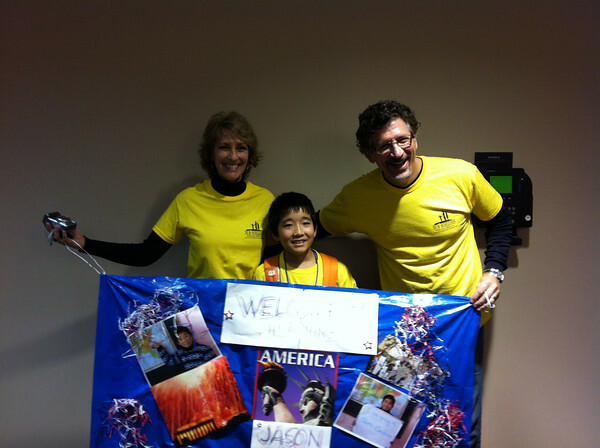 We had said our goodbyes to our host child, Jason early that morning. We then drove 4 hours from the Atlanta airport to our home in Lake Wylie, SC. Jason’s energy and spirit were gone. Our house felt subdued and calm, but missing a key and essential element. After almost 5 weeks of “GO”, it feels good to rest. Yet, at the same time our walking, talking, running, dancing, singing boy with a future is missing. We look forward with expectant hope to a lasting reunion and all the life and vibrant energy he brought to a quiet home. We began our NHFC hosting experience with minimal expectations. After all, Jason was the third child we thought we would host as paperwork difficulties precluded the first boy from getting his visa and another family wanted our second host child, which was a girl. That last hour switch brought us to Jason. Twists and turns to be sure, but God had a plan. Jason arrived late at night after almost 24 hours of travel from his China city. Our almost 11 year old boy was sick and exhausted. We went to a hotel for the night and slept. After breakfast, we drove home. Jason slept the entire way. His body was healing, he would be well soon. He got well and we saw a bright, energized, helpful and mechanically inclined young spirit slowly open himself to us. It didn’t happen fast and a few days were setbacks as working to learn English, meet new people and experiencing new and strange things combined to evoke emotions. However, when the smiles, hugs, laughter, singing and whistling came-it came like Niagara Falls. We had fallen in love with Jason while feeling the responsibility of caring for and teaching him. As he lost his cold and gained his strength, we saw the possibilities of us together. Hosting a child makes you look at your life differently. That may be “THE” point. Look at possibilities, at how we can be used through our love and interaction of a child to further a plan much bigger and more important than what we had in mind. Hosting Jason changed us and placed our agenda next to God’s and made us ask the question…how can we best be used? Thanks to NHFC, our hope and prayer is that it will be as a positive, supporting, challenging, Godly home. That those who have no home can see hope in the flesh. This was really hard to read through tears. Awesome. My heart feels like it is going to burst……. You know, if it took a youtube video (however inaccurate) to make people aware that atrocities, genocides, rapes and slavery are taking place in Africa….sigh. I don’t know what to say. I guess….DUH??!! I mean, I’m glad they raised some sort of awareness for the people. Are they a credible organization? Not from what I have read. I don’t really care who they fund (politically), just that ANY money donated to them was used in a misleading, non-effective way! USE the money given to change what you tell people their money is going to change!!! What really baffles me is there are stories about horrible crimes against humanity being committed on every continent in the world!! Do we have to see a battered child in a video to react? And even if you say “yes” to that….you’ve seen things like this on 20/20, Nightline, etc. What about this Kony campaign has people sooooo enamored? I’d rather watch a video, show, documentary (or read about) a TRUE, GENUINE way we can help those in need. Everywhere. All this “aid” we talk about sending goes to corrupt governments. No “charity points” there, folks. What REALLY can be done?